A run down basement underneath Shoreditch Town Hall is perhaps not the most obvious choice for a children's play about maths, robots and neuroscience. The space suits We're Stuck perfectly, however, as it's more interactive theatrical adventure than traditional sit-down play. 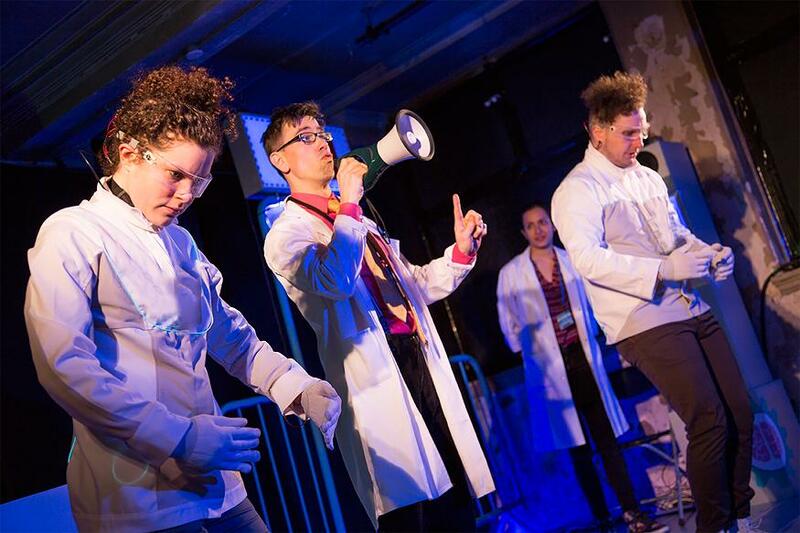 The labyrinthine tunnels have been transformed (by director Sarah Punshon and co-producers China Plate Theatre) into a detailed, futuristic lab, complete with zany characters, fun challenges and a rollicking good story. Fast-paced and immensely entertaining, the action centres around a cast of friendly, goofy and somewhat deranged scientists from Volcano Enterprises. They get the kids embroiled in a series of escapades hopping from space to space to help them solve the mystery of why one of their robots keeps trying to kill everyone. The kids get totally wrapped up in the success or failure of the protagonists. They work together with despotic Dr Volcano (Seiriol Davies), a hapless assistant (Daniel Bye) and his savvy sidekick intern (Avita Jay) to open doors, move robots and save the day from Volcano's evil twin sister Astrid (Clare Dunn) who wants to destroy human kind! Full of surprises, there is never a dull moment as the location changes every 10 minutes or so. As the story progresses we have to follow the cast from room to room, so it's quite labour intensive, but thanks to the warmth, energy and inventiveness of the performers it's extremely exciting for the kids. Not only do they get to know the characters but they are treated as 'professors' themselves, and take the lead in making the 'robots' (who are actually the same actors doubling roles) move, talk and even crump. The show is a great way to encourage children who might find science and maths difficult at school. Computer programming, graphs and simple number puzzles are all covered — if only all maths lessons could be as fun! We're Stuck cleverly skirts the line between an empowering story designed to make kids more comfortable with making mistakes and cheeky humour meant only for the adults. A great choice for an Easter weekend family outing that everybody will enjoy. We're Stuck is on at Shoreditch Town Hall, Old Street, EC1v 9LT until 1 April. Tickets £8-£11. Londonist saw this show on a complimentary ticket.